For quite a while, most Android phone manufacturers insisted on bundling their own Internet browser with their phone skins, despite the fact that Google's Chrome was around... and was, in fact, the preferred browser for many users. See, try as they might, phone makers were unable to make a browser that has all the right features and works fast and snappy, while Chrome has been excelling in this since the day it first dropped. Also, it seamlessly syncs with its desktop counterpart and it's hard to compete against that type of convenience. In fact, many manufacturers have now given up on developing their own browsers, since users just prefer to use Chrome anyway (or alternatives like Opera, Firefox, and others, in some cases). But Samsung stuck with its own Samsung Internet through the years and made it into a... pretty good browser! The company also managed to integrate a lot of the software features that can be found across One UI with its Internet browser, making it a valuable tool for the Samsung-devoted poweruser. And, the app is snappy and fast enough to rival Chrome. So, a lot of customers actually decide and stick with Samsung Internet! How many? Well, we asked you this last year and the results were almost 50 / 50. 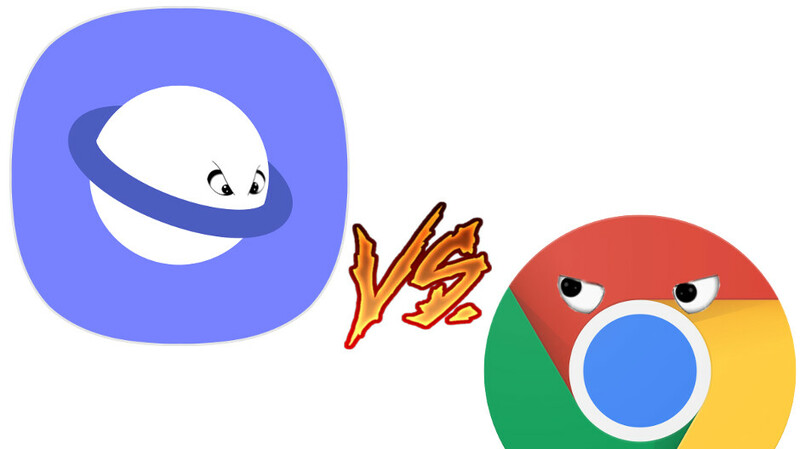 So, here we go again — do you use Samsung Internet or would you rather go straight to Chrome? Do you use Samsung Internet or Google Chrome? I don't even own a Samsung phone but use their browser sometimes. It's one of the best out there. But my main browsers are Opera and Chrome. So I guess my answer would be both. Samsung browser... because of its much better User Interface! Unpopolar opinion: Edge browser on note 8, anyone with me? Visually, Edge is better; functionally, Samsung browser is better. Edge browser on the original Pixel. Now that you can reopen closed tabs in Samsung's browser, I use it exclusively. I find it more intuitive than Chrome. Samsung Internet, not a fan of google. I tried edge but its still not there yet. Used to use chrome but Samsung browser is better for two reasons. Dark mode and ad block. It's all I use now. The Samsung browser is much more power efficient compared to Chrome, and just as fast. No comparison. But I use Microsoft Edge, even better and more power efficient than those. Samsung browser It's the best and fastest. Been using Firefox Fenix I love it! Still isn't ready for beta yet but I can see it easily becoming one of the best browser's. Also use brave browser which is much faster than Samsung browser. The first thing I installed on my P30 Pro was Samsung internet. Hands down the best browser in the play store. While the removal of video assistant and video player features in version 9 is disappointing, Samsung browser is still better because of dark mode and content blockers. Chrome wins when it comes to quick updates and password manager autofill. I've yet to find a browser overall that's better than the stock Samsung. I've used it since at least my Note 5. I'm constantly trying new browsers, but nothing has grabbed me away yet. Samsung gets a lot of flak for its software (some of it deserved), but they knocked it out of the park with this. Got to use Samsung Internet for ad blocking. I've used firefox too, but I keep going back to Samsung. I use Chrome on my OnePlus 6. Didn't vote to skew the results. I use Opera browser on my S8 to minimize data usage since Canada has one of the most expensive data/cellphone plans in the world. Ever since I tried the Samsung browser for the first time a year and some ago, it's the only one I use. I definitely prefer Samsung Internet bcos it support adblock. Chrome oufcourse , i was fan of Samsung but kinda got numb from all the Ads but the sync feature is nowhere to be seen when using and searching plus history , seamless , im rooted so its not a problem for me with the ads but yeah , Chrome takes my devices . Chrome as it syncs with everything. i've been using Chrome, mostly because it syncs my phones and desktops and voted for Chrome in the poll, but this comment section has convinced me to give Samsung's browser a shot.